The Cornish Tour shows the county at its best. The self-guided Cornish Tour covers much of the stunning Cornish coastline of the 4 Day Road Tour, albeit on a slightly shorter circuit. The tours do have a lot in common though: both feature stunning scenery and comfortable accommodation, and with average daily distances of around 60 miles (95km), both are aimed at the serious cyclist. Check in for your first night’s accommodation at Wadebridge Bed and Breakfast in the north Cornish town of Wadebridge. 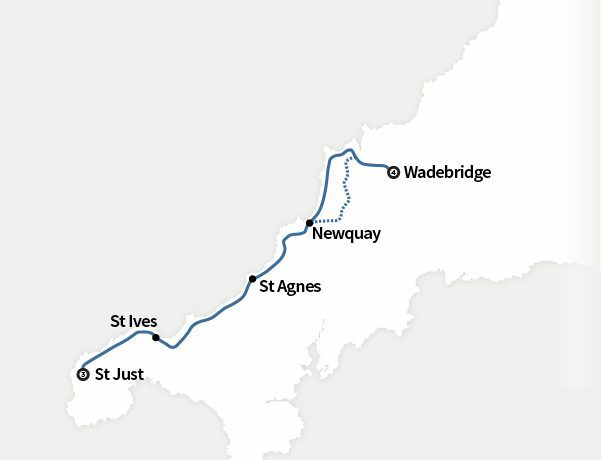 In the afternoon you are free to explore the abundant independent shops and cafés of Wadebridge, or you could stretch your legs by cycling the Camel Trail to Padstow. If you are hiring a cycle for the tour, we will get you set up and make all the necessary adjustments in the afternoon of your arrival, to ensure you are ready to go in the morning. Wadebridge Bed and Breakfast, Wadebridge. Wadebridge Bed and Breakfast is contemporary, eco-friendly guest accommodation with easy access to the town centre, the Camel Trail, local and coastal walks and scenery. With Egyptian cotton bed linen and a hearty ‘full Cornish’ breakfast served each morning, you’ll be well prepared for your first day of cycling. Rooms are available as double or single occupancy with a choice of twins or doubles, and guests have full use of the garden and communal lounge. Leaving Wadebridge, you follow the Camel Trail along the river towards Bodmin. The route passes The Eden Project and joins up with parts of the Clay Trails, then it’s on to the historic port of Charlestown which was used as a location for filming Poldark and Jane Austin’s Persuasion. There is also a shipwreck museum here where you will see spectacular tall ships docked. Next stop is Mevagissey, a small working fishing village with narrow streets filled with gift shops, cafés, galleries and pubs. From Mevagissey the route takes you along quiet country lanes, past beautiful beaches and the impressive Caerhays Castle, deeper into the beautiful Roseland Peninsula towards St Mawes. St Mawes Castle is one of Henry VIII’s coastal fortresses, which you must take a moment to look at before coasting down the hill to the village of St Mawes and hopping aboard the ferry to Falmouth, home to the world’s third largest natural harbour and the National Maritime Museum. The Gyllyngvase House Hotel, Falmouth Gyllyngvase House Hotel offers quality accommodation and all the necessary facilities of a small hotel. This is a friendly, family-run hotel situated only 200m from the seafront at Gyllyngvase beach, with Falmouth town centre and historic harbour just a few short minutes walk away. The hotel has 13 bedrooms, comprising of doubles, twins, family rooms and singles. Paul and Emma Lower are the proprietors of this family run hotel and will personally supervise all your arrangements during your visit. Option to vary route: With the last St Mawes to Falmouth ferry leaving at around 5.15pm, cyclists have the option to stay overnight in St Mawes if they would prefer a more leisurely day. Alternative accommodation is in The Victory Inn, St Mawes, and has a surcharge of £25 per person. 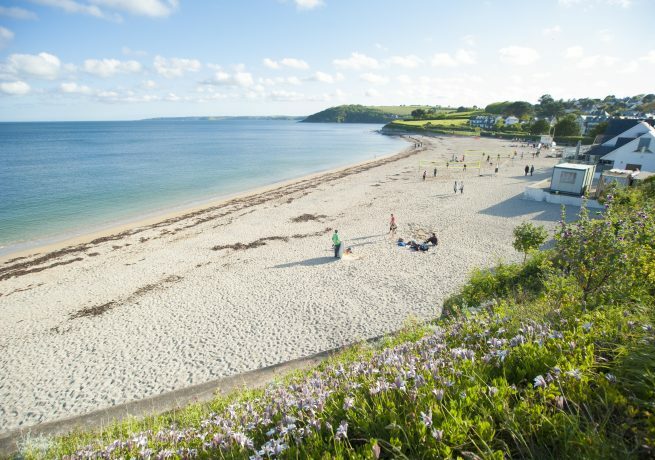 Leaving Falmouth you pass Trebah Gardens and the beaches of Swanpool and Maenporth, as you ride towards Helston, home of the Flora Dance festival. You will then cycle across the Lizard Peninsula towards the beautiful village of Porthleven. 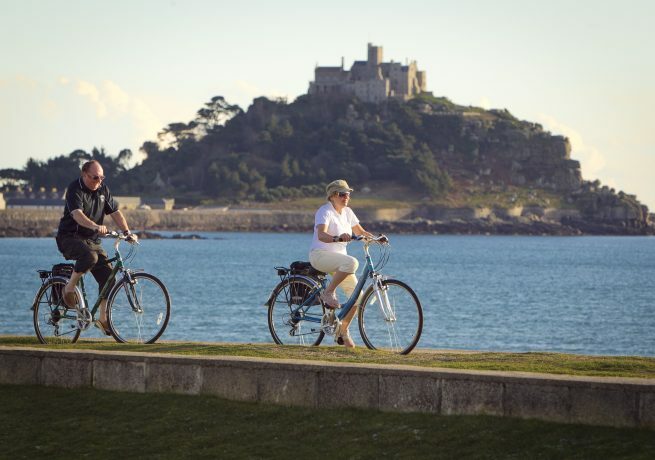 From Porthleven the tour follows the coastal lanes to the seaside village of Marazion, which affords breathtaking views over St Michael’s Mount and Mount’s Bay towards Penzance. The afternoon starts gently with a ride along the coast through the fishing villages of Newlyn and Mousehole as you head out towards Land’s End. On the way you will pass the Minack Theatre, a unique auditorium and stage carved into the cliff above Porthcurno. From Land’s End, which is England’s most westerly point, it is possible to see the Isles of Scilly on a clear day. The day’s ride ends at one of the most ancient mining district in Cornwall, St Just. The Commercial Hotel, St Just The Commercial Hotel is situated in the centre of St Just. A former coaching inn, the Commercial Hotel has been run by the same family for over 100 years and is well-known locally for its warm, Cornish welcome and excellent home-cooked food. Located a mile from Cape Cornwall, the area is rich in Cornish culture and heritage, with ancient Celtic sites and hidden coves littered along the coastline, with Sennen Cove Beach and Porthcurno close by. All 11 bedrooms are en-suite, non-smoking rooms with televisions, hair dryers, and tea and coffee making facilities. Leaving St Just, the tour follows lanes which hug the clifftops of the north of Cape Cornwall and Poldark country. The area’s mining heritage is clearly visible here, with engine houses and ruined mine workings still standing at Botallack and Levant, and the Geevor Mine museum at Pendeen. The route then takes you through National Trust land at Rosemergy, Porthmeor and Gurnard’s Head to the village of Zennor. Then on to St Ives, which is well known for its artists, the Tate gallery and the Barbara Hepworth Museum. The tour passes Hayle’s three miles of golden sands and on towards St Agnes with its beautiful scenic coastline, fantastic beaches and art and craft shops. Leaving St Agnes we cycle through the Blue Hills, a valley of gorse and heather, to Perranporth. The route takes coastal lanes to the charming village of Crantock before arriving in Newquay famous for its surfing beaches and vibrant night life. The final leg of the day’s ride takes you along the coast, past Watergate Bay, Mawgan Porth and the stunning rock stacks at Bedruthan Steps to the ancient fishing port of Padstow, the starting point of The Camel Trail which takes you back along the estuary to Wadebridge. 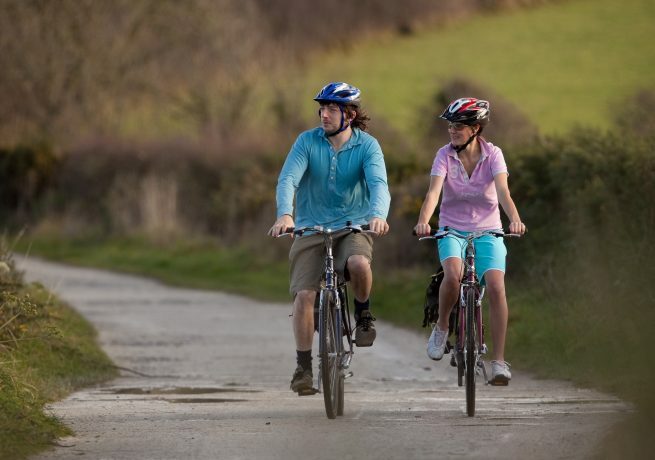 Alternative Route: As the coastal lanes between Newquay and Padstow can be very busy in summer, cyclists can choose an alternative route which follows National Cycle Route 32 through St Columb Major. The alternative route adds 7.5 miles to the daily total. This elaborately decorated Henry VIII era coastal fort is steeped in heritage and history, and offers spectacular views across the Fal estuary. This outdoor theatre offers performances in one of the most unique and spectacular locations in the country. With dramatic clifftop views, Carnewas Beach and Bedruthan Steps is one of the most popular destinations in Cornwall, and a must-see when visiting the north coast.